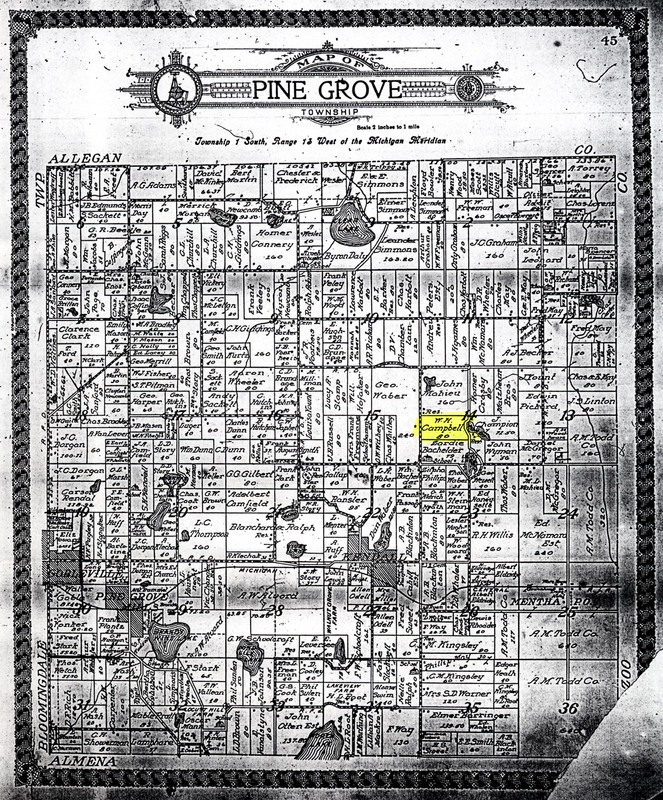 This is a plat map of Pine Grove Township in Van Buren County, Michigan in the year 1912. It can be found on FHL Film # 2022153C Item #3, Standard atlas of Van Buren County, Michigan, page 45. This map is a treasure to me because it shows the 2nd great grandfather of my husband, Walter Henry Campbell. His land is listed in section 14, plot 80 (with the yellow highlight). Walter Henry Campbell was born 31 May 1845 in Almena, Van Buren, Michigan, the son of Henry Campbell (1821 – 1873) and Ruth Newcombe (1823 – 1905). He married Harriet Adela Fuller on 23 December 1869. Together, the couple had seven children: Shruid Grant Campbell (1871 – 1925), Willard De Forrest Campbell (1872 – ? ), Herbert Henry Campbell (1875 – ? ), Birdie Campbell (1882 – ? ), Lee Campbell (1883 – 1961), Frank A. Campbell (1886 – 1902) and my husband’s great-grandmother, Wava Cecil Campbell (1888 – 1957). We are proud to share that Walter Henry Campbell served our country as a Union Soldier in the Civil War. He was part of the 13th Michigan Infantry, Company G.
Walter is buried in Kendall Cemetery in Pine Grove Township.You can see his headstone on his Find a Grave Memorial. He died 14 January 1917 in Pine Grove, Van Buren, Michigan. Be aware that if you click on this map to make it bigger, it will be MUCH bigger! You might have to scroll around a bit to close the image. I wanted to upload it here in high resolution in case you are searching for your own family on it. Good luck in your research, and may you find many treasures of your own! I would like to thank my friend Sarah for locating this map on microfiche for me at the Family History Library in Saline, Michigan. http://www.jessicagreen.com/wordpress/2012/03/15/treasure-chest-thursday-pine-grove-township-plat-map-1912/You must be logged in to post a comment.